The external radiation dose calculator calculates the radiation dose from a shielded gamma source with an evenly distributed concentration of radionuclides. For source and shield, a number of common materials and compositions of natural radionuclides can be selected, or a custom mix of elements and radionuclides can be entered. (Currently, the calculation gives incorrect results for gamma emitters in the shield. Therefore, only put radionuclides in the source! If you need radionuclides in the shield, run the program twice (once treating the shield as the source) and add the results). Basic parameters are entered on the left (white) side of the table. Advanced parameters are entered on the right (grey) side of the table. Three versions of the calculator are available; one version models a rectangular slab source, another models the inside of an annular cylinder (drift in ore) source, and another calculates the thickness of shield required to obtain a given dose rate using an annular cylinder source. Once all parameters have been entered, the calculation is initiated by pressing the Calculate button. The calculation may take some time based on the number of integration steps chosen. Some browsers may produce a warning indicating that the script is taking a long time to run. Either change the settings on your browsers, some suggestions on how to do this is given later in this document, or dismiss the warnings and continue to allow the script to run. The result are displayed in the Results text area. Do NOT use the Refresh button on your browser. (This results in an incomplete refresh.) If you want to refresh the page, close your browser window and open it again. 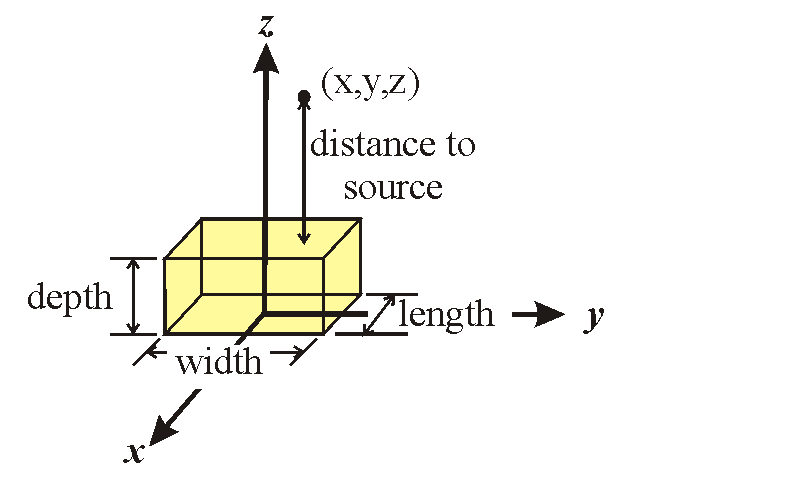 The following is a list of basic geometry parameters that are used with a rectangular slab source. 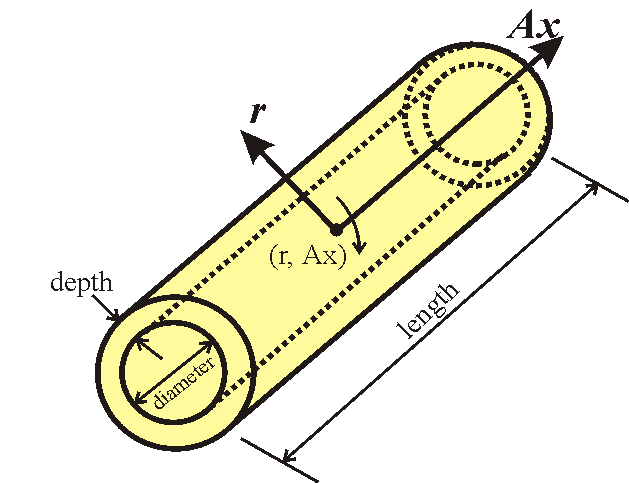 The following is a list of basic geometry parameters that are used with a cylindrical drift source. The fields in this section contain information about the coordinate system used internally by the program as well as user editable fields that modify the location of the detector. In the rechtangular geometry, the receptor can be moved in the x and y direction (the z location is determmined by the distance to source entered in the basic setup). In the cylindrical geometry, the receptor can be moved in the axial (Ax) direction. When a material is selected from the drop down menu, the table is filled with the elements and radionuclides that make up the given material. If the values from the ore grade section are selected, the table reverts to its default values. The table is composed of element names (e.g. U) and radionuclides (e.g. U-238) along with their associated abundance in percent-weight or, for radionuclides, their activity in Bq per gram of source material. An asterix (*) preceding the number indicates that the number represents activity in Bq per gram instead of percent-weight. A list of radionuclide compositions and radionuclide series that may be entered in the table is given below. The number of shield layers must first be selected. The program supports 0-6 shield layers; however, when calculating the shield thickness required to achieve a given dose rate, only one shield layer may be used. The thickness for each shield layer must be entered. Once the number of shield layers has been selected, the properties for each shield layer can be entered. A predefined material can be selected from the drop down menu or a custom mix of elements and radionuclides can be entered in the table located in the advanced section. When a predefined material is selected, the table is filled with the elements and radionuclides that make up the given material. The table is composed of element names (e.g. U) and radionuclides (e.g. U-238) along with their associated abundance in percent-weight or, for radionuclides, their activity in Bq per gram of source material. An asterix (*) preceding the number indicates that the number represents activity in Bq per gram instead of percent-weight. A list of radionuclide compositions and radionuclide series that may be entered in the table is given below. (Currently, the calculation gives incorrect results for gamma emitters in the shield. Therefore, only put radionuclides in the source! If you need radionuclides in the shield, run the program twice (once treating the shield as the source) and add the results). The following is a list of other user set parameters. Number of integration steps - the number of steps along each axis, in the given coordinate system, that should that should be used when calculating the dose rate. The more steps, the more accurate the results and the longer the calculation will take. The default values produce pretty good results in a reasonable amount of time. The following parameters are only available when calculating the thickness of shield required to achieve a given dose rate. Target Dose Rate - the desired dose rate. The program will continue to increase the shielding thickness until the dose rate is at or below this level or the maximum number of iterations are reached. Shielding Thickness Step Size - the increment used when increasing the shielding thickness. The program will start at a shield thickness of zero and increase the thickness by this increment until the target dose rate is achieved or the maximum number of iterations are reached. The program numeriaclly integrates the point source kernel over different volume sources behind shielding. Self-shielding within a volume source. Attenuation of Gamma radiation through a selection of common shield materials; if no attenuation data is stored for the shield material, it is calculated from the shield's elemental composition. Shielding of the gamma radiation in a selectable number of consecutive shield layers, according to the material properties of the shield(s); for volume sources, it is simplistically assumed that the radiation passes the shield perpendicularly, and the dose is calculated for the resulting circular area source at the top of the layer, while for point sources the direct radiation path is assumed between source and receptor. Radiation from radionuclides other than those for which decay energies are contained in its database. Gamma attenuation from shield materials not contained in its database, nor composed of elements for which shielding properties are stored. Change in the radionuclide compositions with time due to decay. In the location bar enter About:config. Change the value of the variable dom.max_script_run_time to a large value. Warning: The following solution requires you to edit the registry. Incorrect edits to the registry may cause serious problems potentially requiring a reinstall of the operating system. Use the following procedures with caution. EIC Inc. will not be held responsible for any damage caused by attempting to use the following procedures. Using a registry editor, add the key MaxScriptStatements, type DWORD, to the branch HKEY_CURRENT_USER\Software\Microsoft\InternetExplorer\Styles. Set the key's value to a large number. Alternately, download the registry entry Jscript_Time.reg by right clicking on the link and choosing Save Target As.... Once the file has been downloaded, merge it into the registry by double clicking the file.